Sometimes it seems like the more we learn, the more questions we have. In this blog series, I’m going to try to answer some of the many library management questions that come to Demco following their events, webinars and other interactions with library staff. Some answers will be based on my 31+ years’ experience in libraries but, frequently, I’ll share input and expertise from many others in the field. Each month we will focus on a different theme as we present these questions. Since developing motivated teams is so critical, where better to start. I think we should always keep learning … don’t you? Now, that’s a great question! Question: How can I motivate my staff? I don’t have the money to give them raises! Think of some of the very best days you’ve ever had at work. Did they happen because your boss came over and handed you money? I doubt it. More than likely, you received a compliment or some appreciation or a promotion or the opportunity to be challenged by something new. In order to know which of these (or what other options) would help with staff motivation, first, you really have to know them. As you’re reading this blog, can you think of everyone who reports to you and honestly say what their number one career goal is right now? If not, start there. Supervisors and leaders who take the time to know what goals people have — and then make honest efforts to help them be reached — are the people who can motivate anyone to do anything. Loyalty goes a long way. Care about your team, help them grow and feel appreciated — and they’ll be motivated to be dedicated and productive employees! 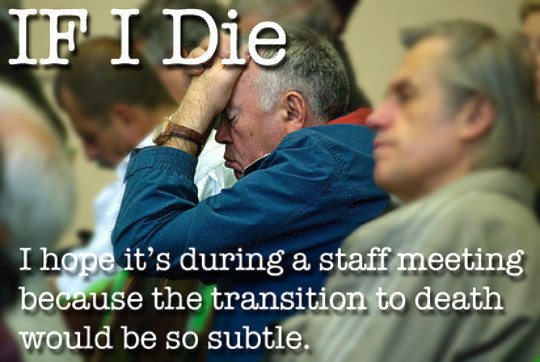 Question: Is it okay to not have staff meetings anymore, since we just don’t have the time for them? Arrggh. No. It’s never okay. Go to any — and I mean any — workshop or training on effective workplaces and you’ll hear over and over what the one most valuable key to them is — communication! So, what do you do when there just doesn’t seem to be time available? You find some. First, let’s talk about why, so that you’re convinced it’s worth the trouble. Staff meetings do several things for both the leader and the team. For the leader, they provide a chance to actually listen to the ideas, input and suggestions of those working on the front lines. Anyone promoted to a supervisory position knows that it doesn’t take long for the distance from their office to the patrons to stretch pretty long. That connection to what’s really going on is key. Plus, meetings give leaders a chance to let staff know they care enough to listen. For the team, meetings provide often critical information that can help them be successful in their work. Emails are okay. Notes on the bulletin board sometimes work. But nothing can beat getting everyone in one place at one time and being clear about what’s important. Then, there’s a question of value. Staff I’ve worked with who no longer have meetings tell me that must mean their leaders simply don’t care enough to involve them in decision making, idea generation or anything of deep value. “Just get out there on the desk and work.” That’s what they hear — when they don’t hear anything else. Try early morning (short) meetings. Getting staff together before the doors open can make scheduling a bit less challenging, since they have to be there anyway and all you need to do is find everyone a little comp time to make up for it. Consider trading with nearby libraries, either within or outside of your library system. Let them send desk coverage for your meetings, then you can do the same. Not only does this allow you to get off the floor with your staff but, inevitably, everyone learns a lot from seeing how others do it. Have two meetings and switch the staff back and forth, from floor coverage to attendance, and duplicate the information. Ask the staff. Ask them how they think it could work that staff meetings could continue. I’ll bet, if you listen, you’ll hear lots of great ideas!